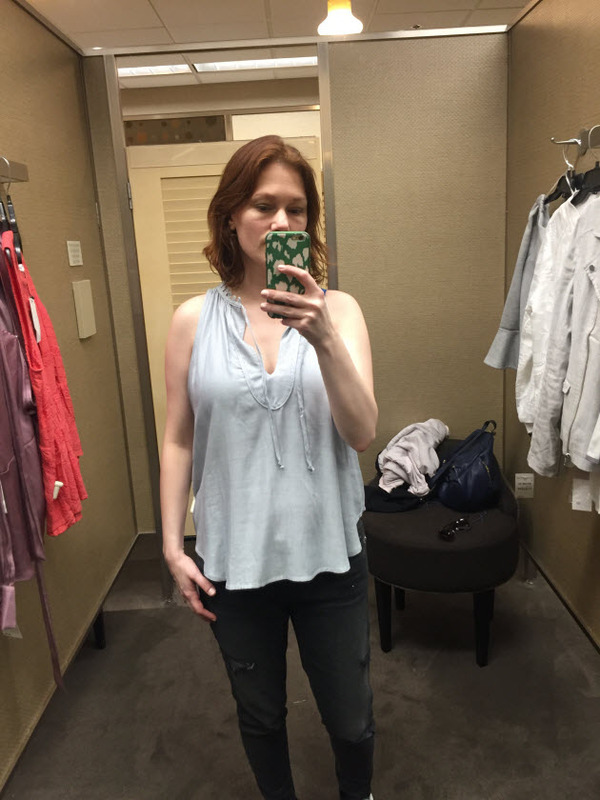 When we were all together a while back I was lucky enough to go shopping with Laura & Cam. 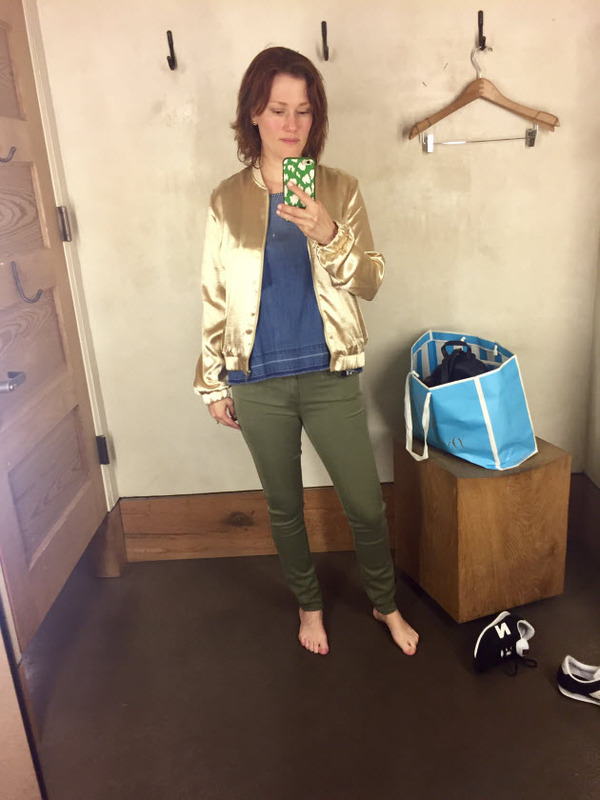 We went to Anthropologie plus the mother of all Nordstroms in Dallas so we could take dressing room selfies! 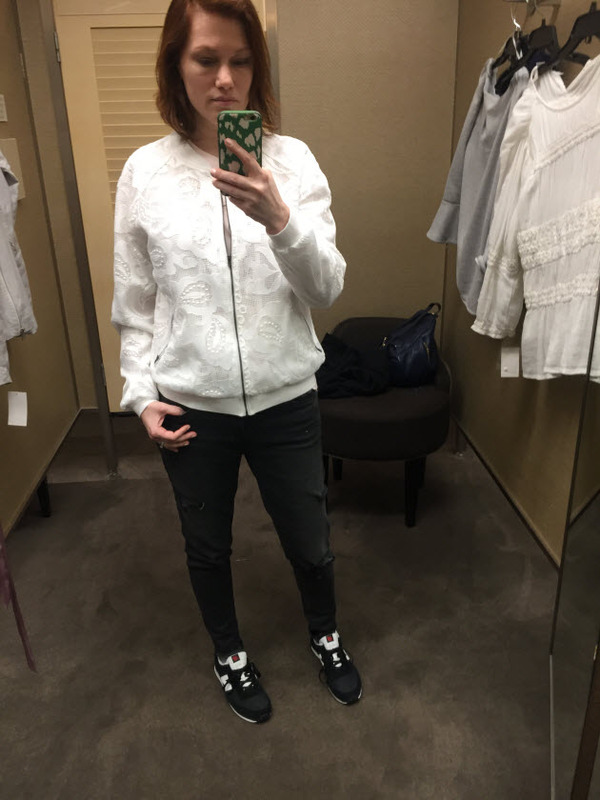 Here are some of my spring faves from our shopping session, including the best little jackets. 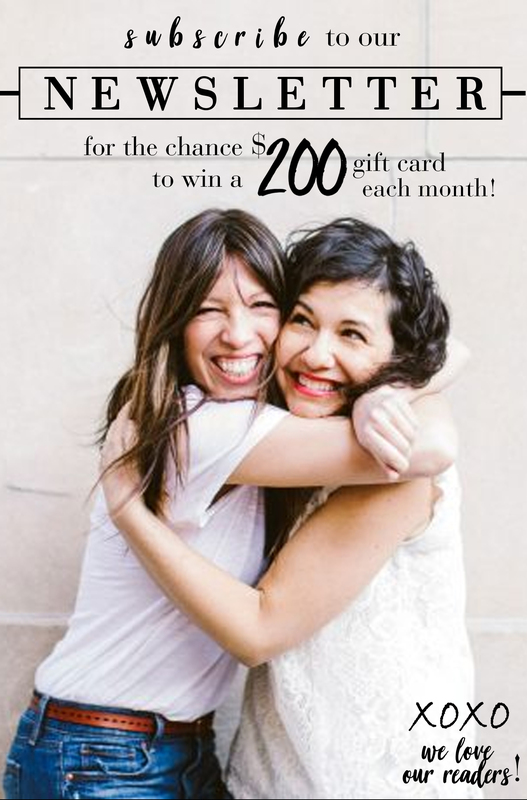 Bonus – most of it is part of the Nordstrom half-yearly sale, going on now! 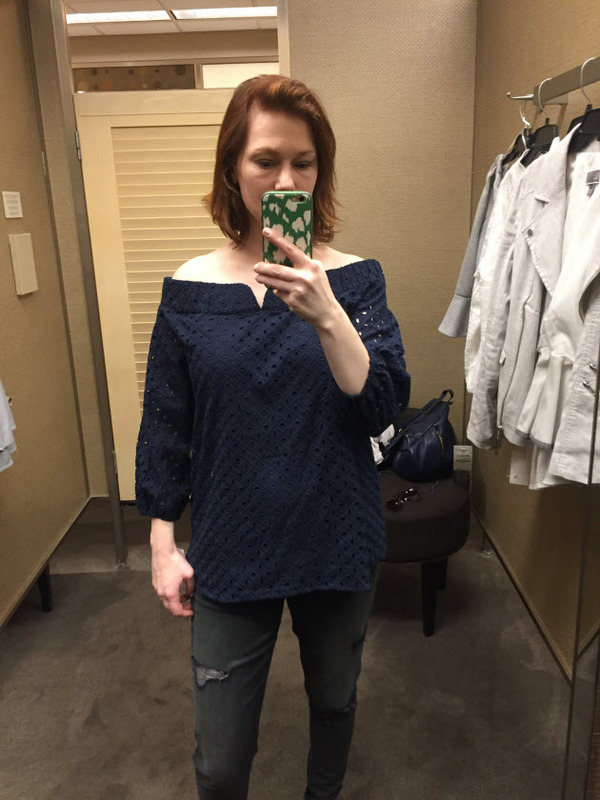 Gibson Bell Sleeve Sweatshirt: Great way to make a basic sweatshirt way more interesting. Love this one. 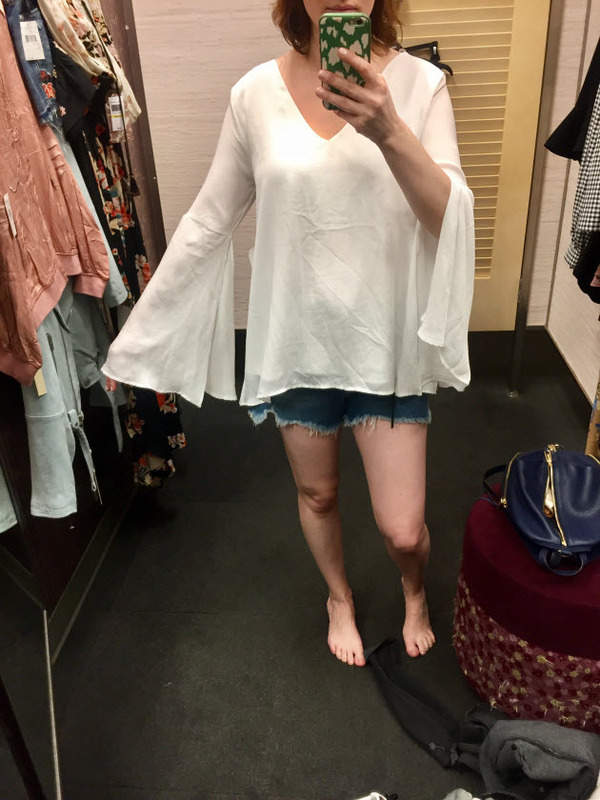 Split Sleeve Top: I felt like some kind of boho princess in this pretty top. 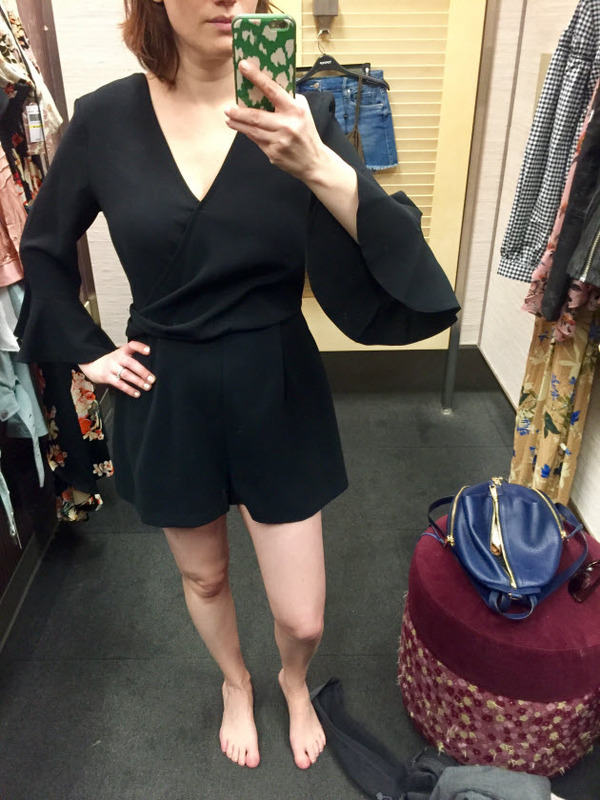 The split bell sleeves are great because they don’t get in the way when you’re eating, wrangling the kids, etc. Double layer so no see-through, floaty and light. 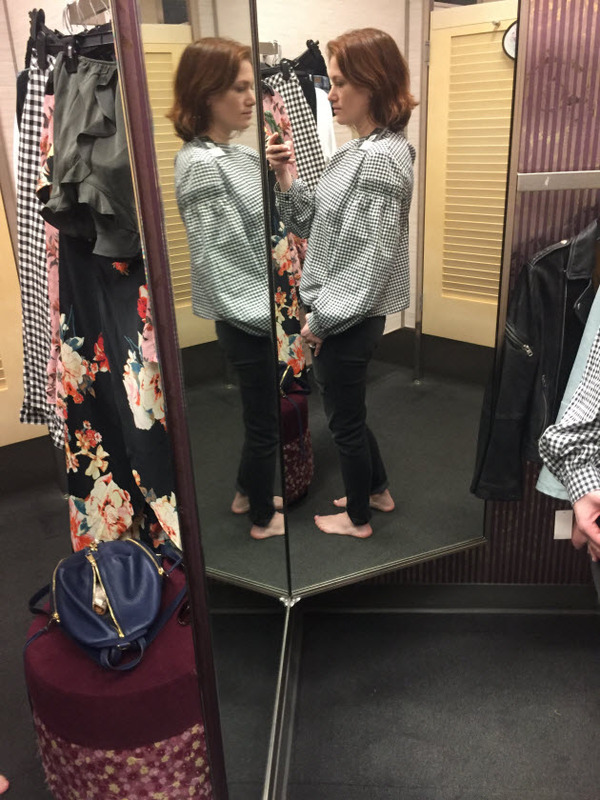 Topshop Gingham Top: I was surprised that I actually liked this top, but it was super cute! The black ribbon tie in back is so sweet. 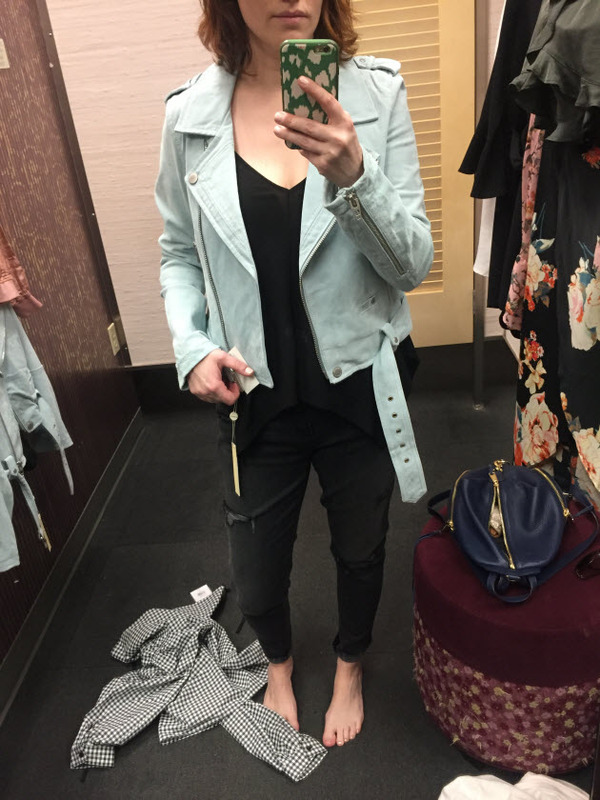 Blank NYC Morning Suede Moto Jacket: Cannot say enough good things about this little jacket! It fits wonderfully and is really well made; the details are so good. 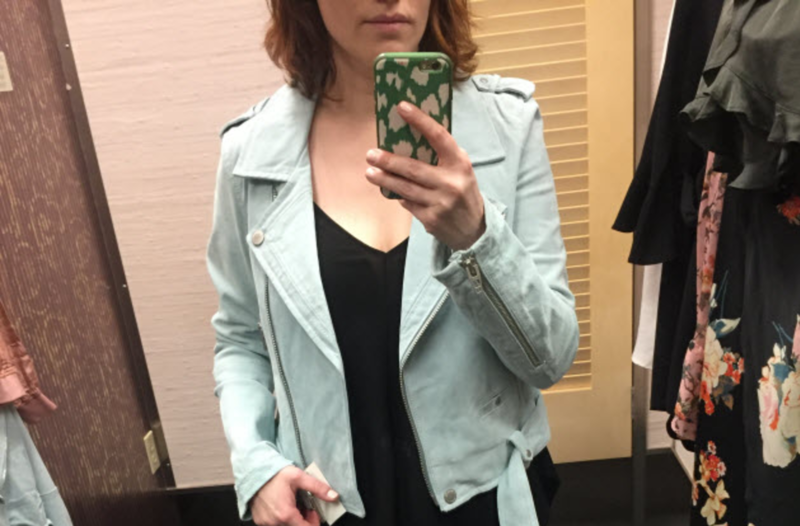 Also, it comes in 8 colors, so just choose your fave – mine’s Mint! Amazing price, too. 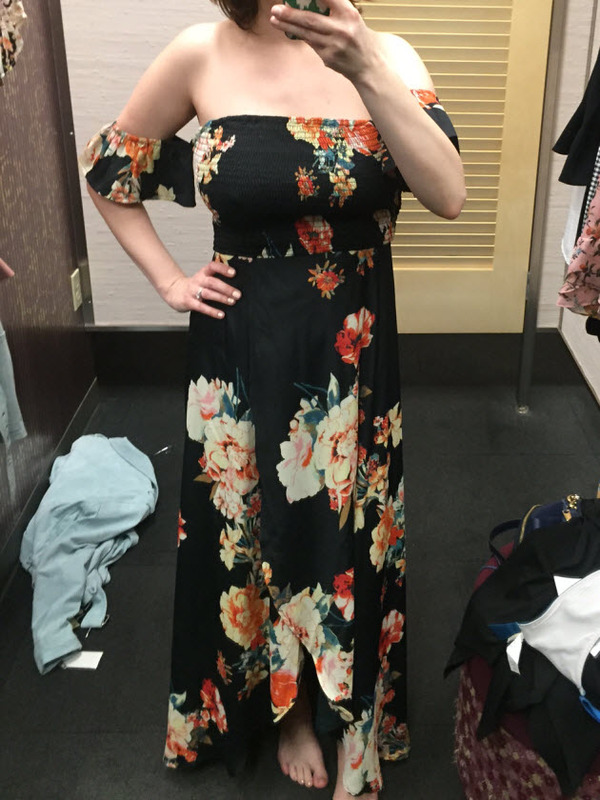 Part of the Nordstrom sale! 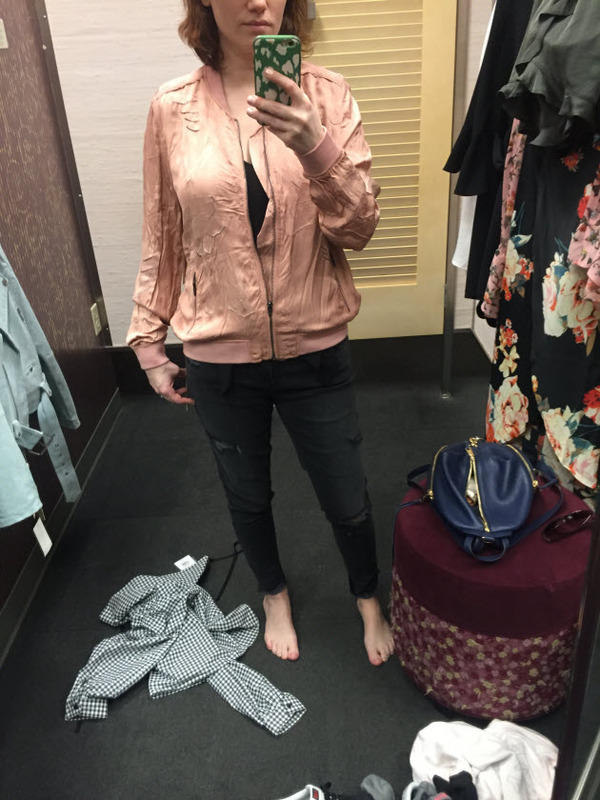 Blank NYC Satin Bomber: This bomber is such a delicious pink that looks great on everyone. Metallic floral details make it unique. 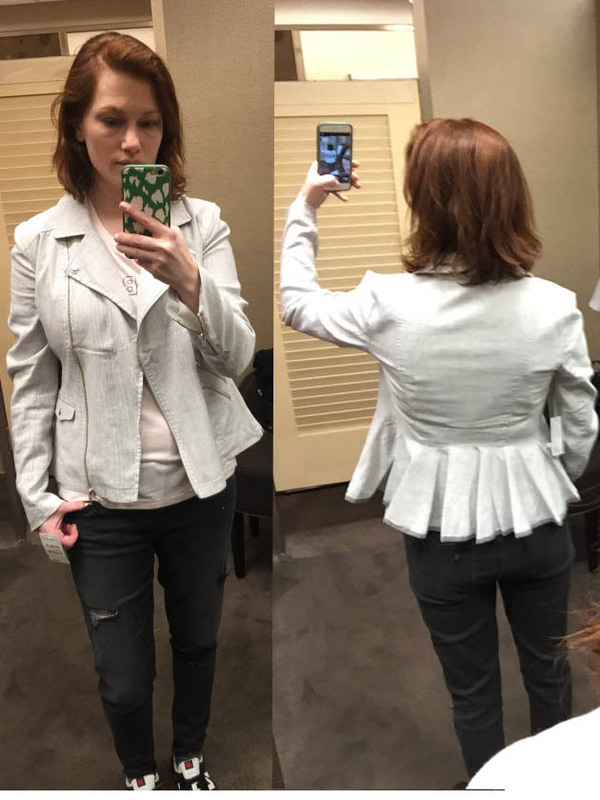 Peplum Back Jacket: SO CUTE. The best of both worlds – moto in the front, peplum in the back. So unique and a total outfit maker that doesn’t look too try-hard, just effortless cool. 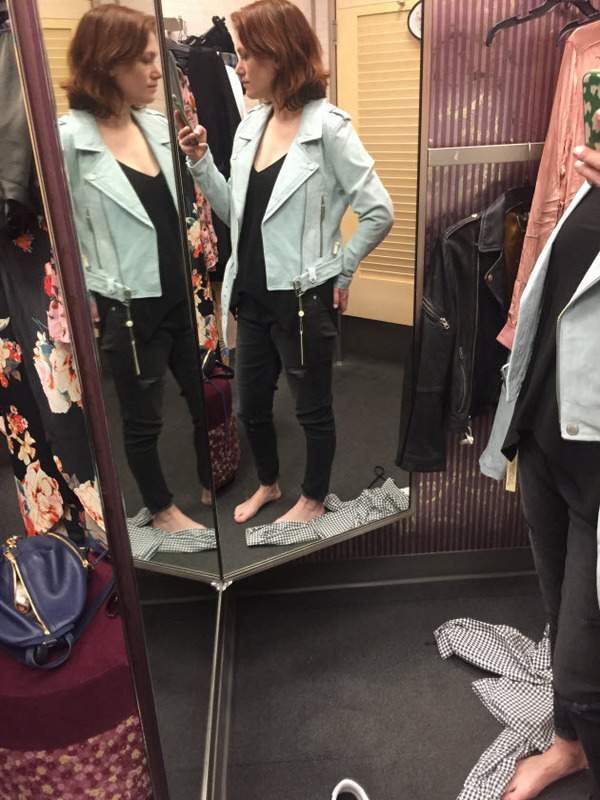 Topshop Leather Moto Jacket: This Topshop leather moto is really well made and comfortable, not too bulky. It’s lined, so definitely for cooler weather. So soft. 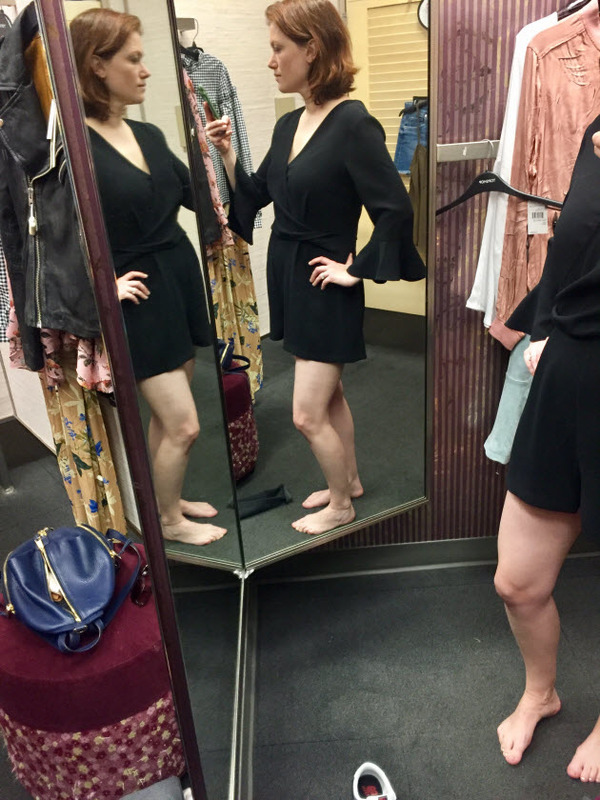 Wrap Romper; I am not a romper person whatsoever because my torso’s so long, but I liked this one since the faux-wrap front and drapey shorts were more comfortable. 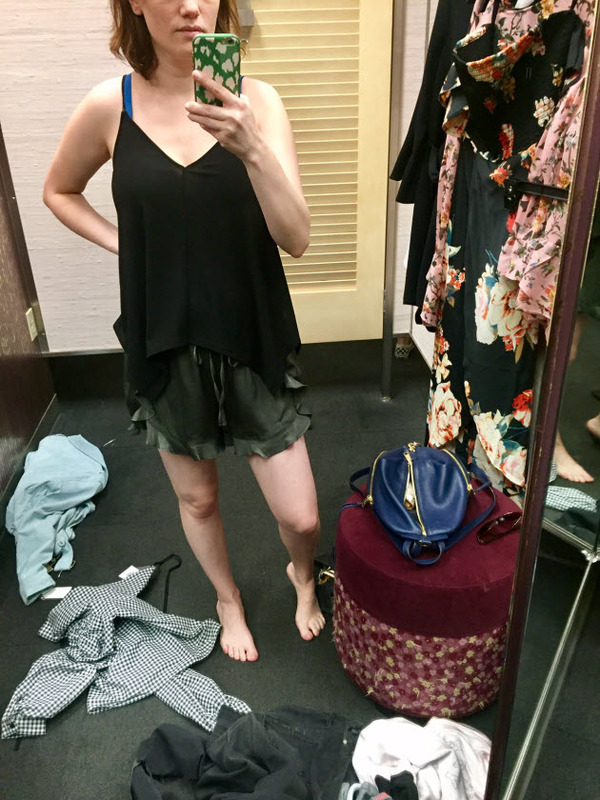 Roleau Swingy Cami: I was surprised at how flattering these cropped swingy camis are – they hit at a great spot to camouflage soft bellies and make your legs look longer, yay for petites! A million colors, $30! 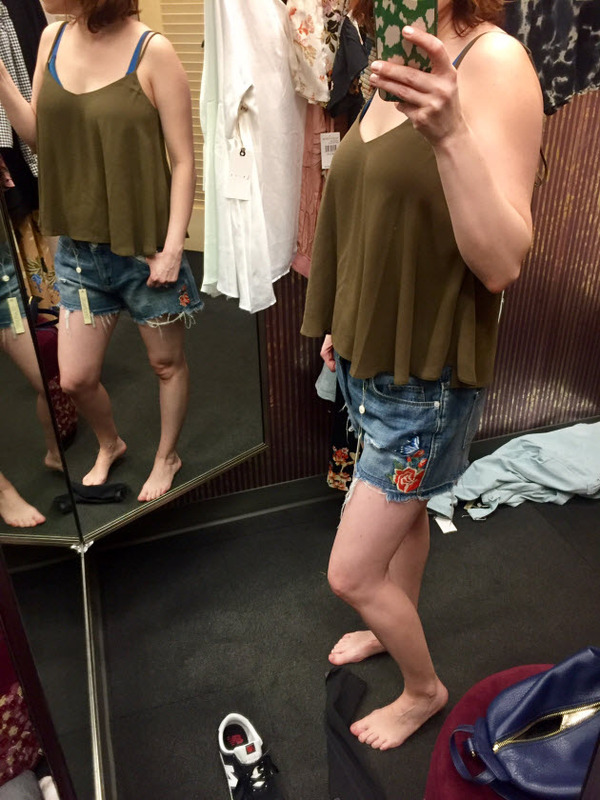 Wearing with these cool Blank NYC cutoffs, these were really fun. 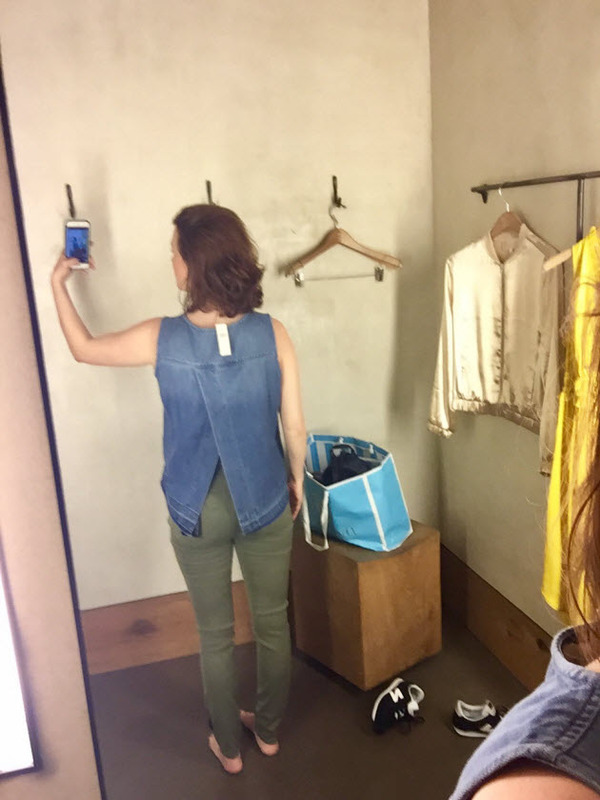 I definitely could have sized down since they hit a little bit higher on the waist. 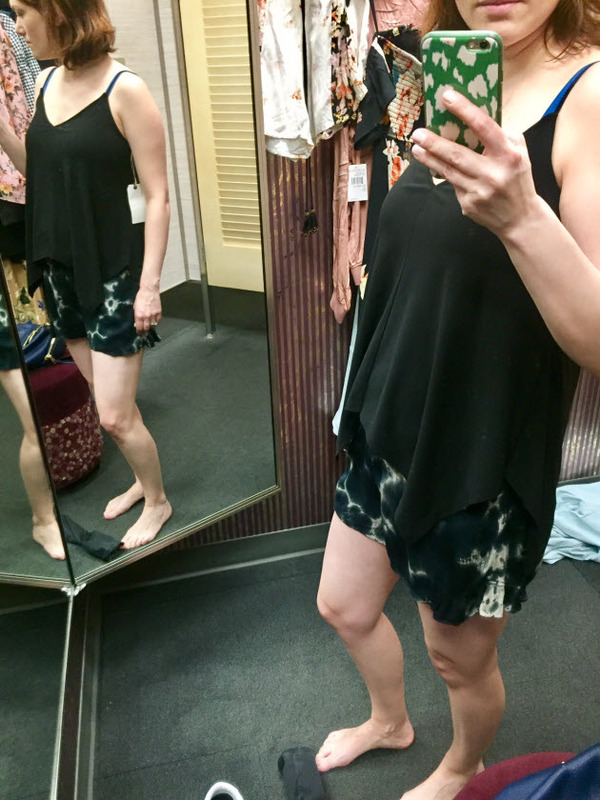 Tie Dye Shorts: These shorts are really comfy as a swim coverup, beach days or super casual afternoons with the kids. Ruffle Satin Shorts: Silky, cute little shorts for everyday or lounging, pretty olive color is a nice alternative to black. 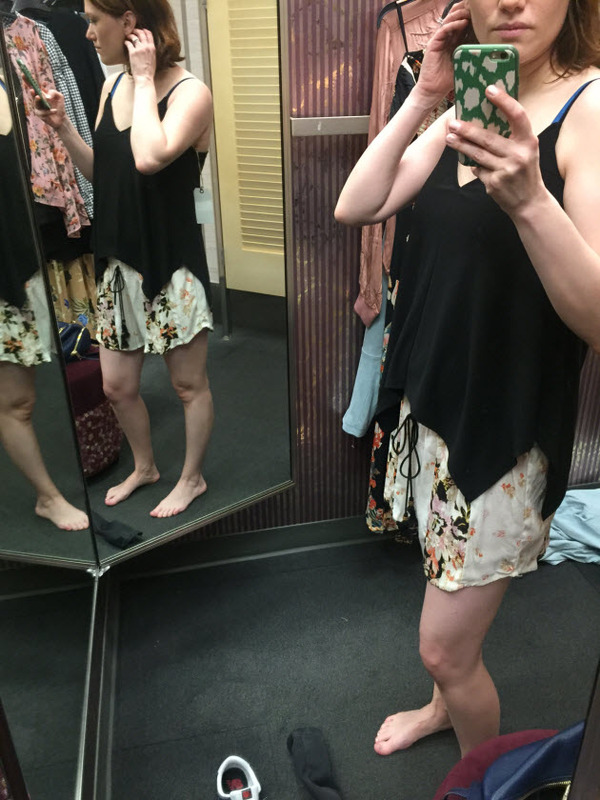 Floral Print Shorts: Lovely flowy boho shorts as a swim coverup or casual outfit maker with a soft tee and sandals. 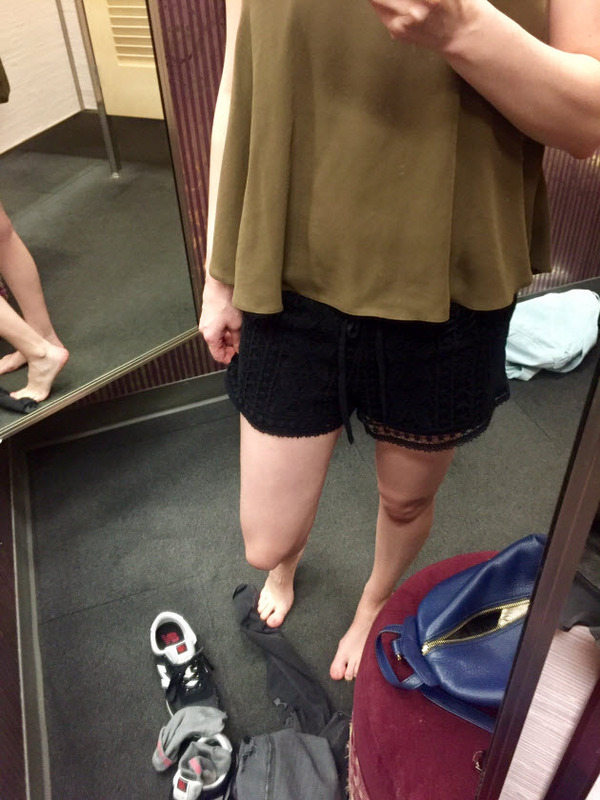 Floral Crochet Shorts: These are super comfy pull-on shorts. I’d wear them as a swim coverup but also love them paired with a summery blouse like on the model. 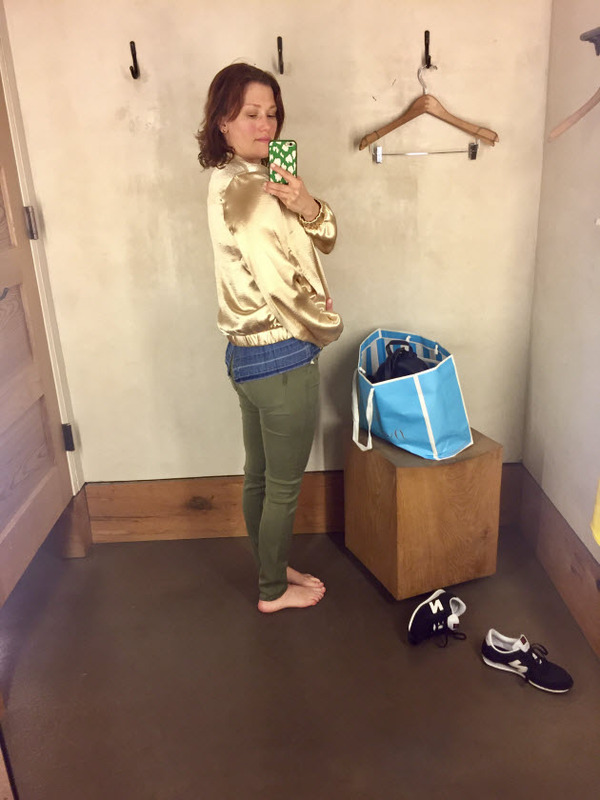 Loved the silky Bomber (on sale), this swingy Denim Top and the olive green Paige Verdugo Jeans are so versatile. 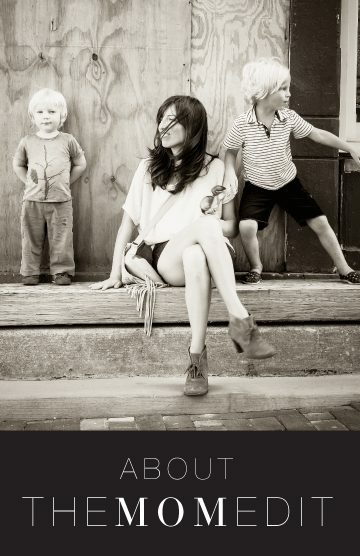 You could mix & match these three pieces with outfits all spring and summer long. 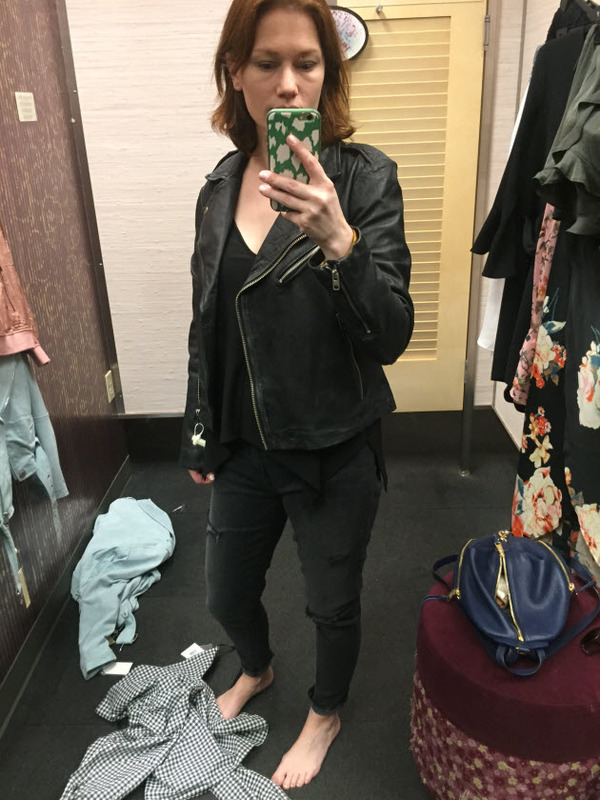 The bomber and denim tank are true to size, the Paige skinnies fit a bit smaller than the regular denim fabric version, so you may want to size up. 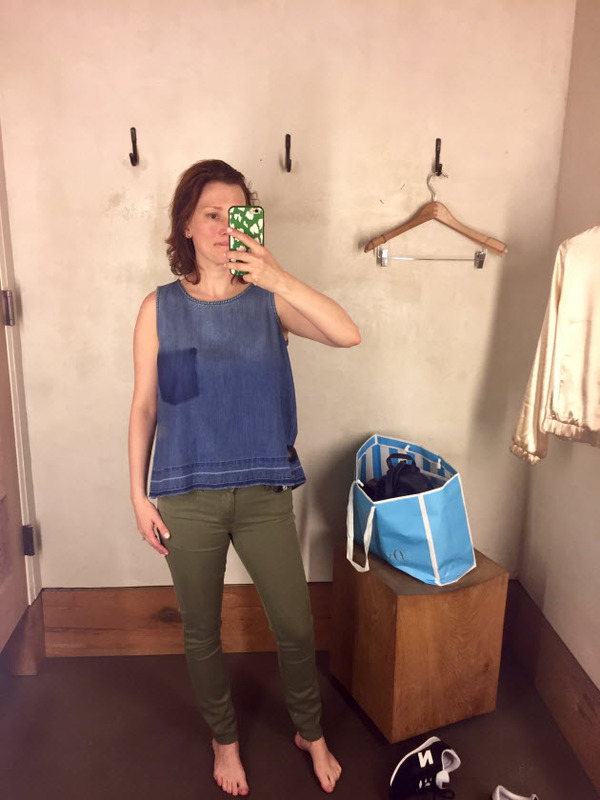 (You can also see the denim tank in action in this post). 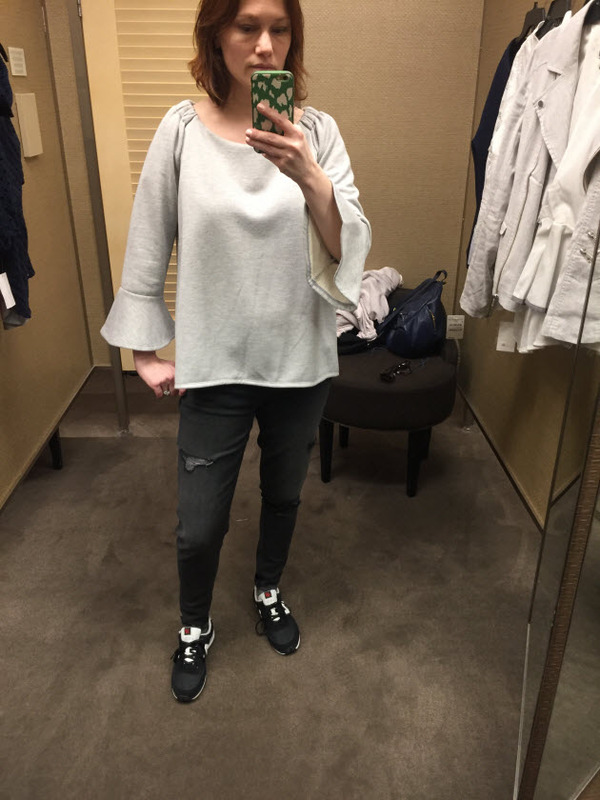 Great review of sale pieces! 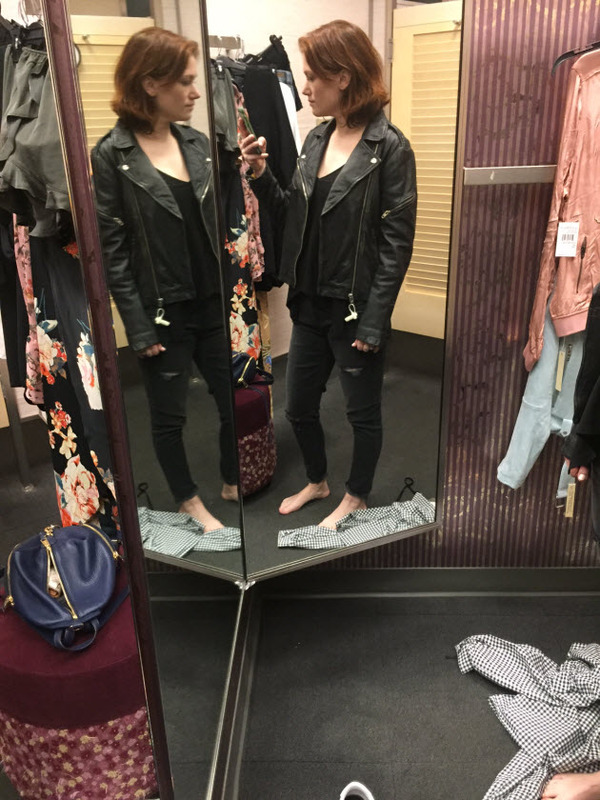 However as s former store manager, don’t throw the clothes on the floor. 😟I see you gingham too. Thanks, Michele! I can assure you I hung them all back up before leaving the dressing room. Love this! And love her iPhone case! Where is it from? Aww thanks, Bronwyn! It’s got me rethinking my Madwell moto obsession…this one is a much nicer price! Jeez, have a little respect…that is just disgusting to throw clothes on the floor like that:(!